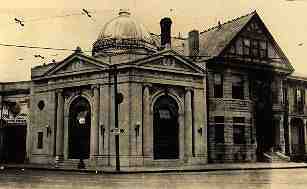 The Canal Bank & Trust Company went into liquidation on March 1, 1933 following the National Bank Holiday. Originally organized as the New Orleans Canal and Banking Company in 1831, this financial institution was succeeded on May 22, 1933 by the National Bank of Commerce in New Orleans. Photo shows the Lee Circle Branch.